Sometimes I write little because nothing's happening, other times because so much is happening I can't stop to write about it! Fortunately the last few weeks have been the second case. In my last post  I talked about wanting to hook Python to the Qt port for the PlayBook. Since then, after considering other approaches, I decided to take a closer look at PySide . My quick review of it concluded that I'd be duplicating key parts of its functionality if I tried doing anything from scratch. With encouragement from the #BlackBerryDev IRC channel on Freenode, Xitij Ritesh Patel (who has been "BBX-Python's" biggest fan) and I set up a Rackspace Cloud server and got to work, sharing a single userid via screen for some remote pair programming. Just a quick update since it's been months of silence (and waiting, mostly) and things are starting to move again. Tonight I decided that it was time to take the QML "Hello World" code I'd written a couple of weeks ago, and see what it would take to hook that up to Python somehow. This is definitely not ready for serious use, but I thought I'd share a screenshot with the first text rendering support for BBX-Python. Here are a few quick notes on what's happened with BBX-Python since the last update. 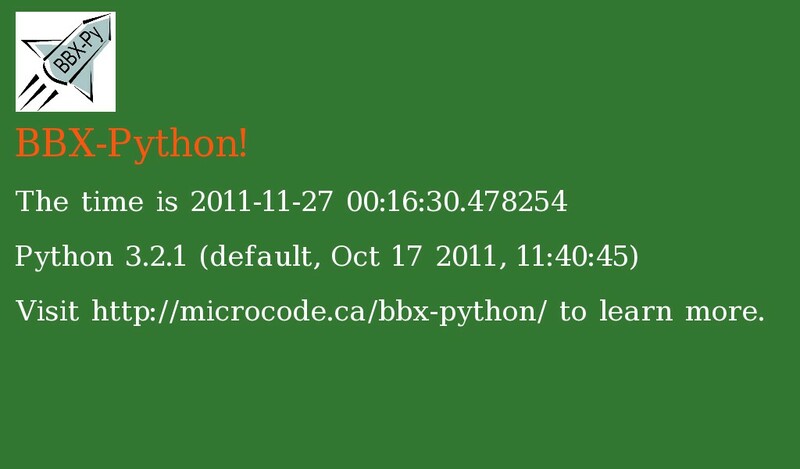 In case you've been following the work on a native launcher for Python apps on BBX (PlayBook), you'll be happy to I've just set up a BBX-Python project web page with the code hosted the bbx-python bitbucket repository.